The projects is aimed at developing 3D models of the permeability anisotropy imposed by structural heterogeneities. 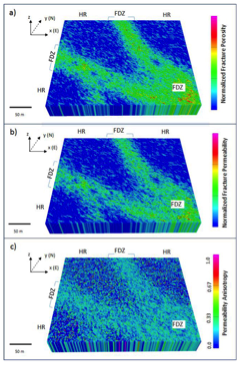 Fluid flow modelling is performed in different types of sedimentary rocks crosscut by a variety of fault zones by integrating all the available structural and petrophysical information with those arising from sedimentological and stratigraphic analyses. The modelling is through analytical means, numeric modelling and up-scaling techniques by using the MOVETM software (to build up DFN models) and the MODFLOWTM and FEFLOWTM software (for fluid flow simulation). Expected outcomes of these procedures will allow us to investigate: i) variation of fracture properties with confining pressure; ii) relations among fracture density, geometric anisotropy factor and percolation thresholds; iii) fluid flow modalities within a fractured media. Output hydraulic properties from DFN model and fluid flow simulation of faulted sedimentary rocks (injector-producer pair steady-state draw-down numerical experiments).